Two weeks after the latest shock for Europe's establishment parties, when Sweden's ruling coalition suffered a dramatic drop in support in the latest elections, Sweden’s newly elected parliament voted to oust Prime Minister Stefan Lofven - leader of the center-left Social Democratic Party - in a vote of confidence, officially ending his tenure as head of government. 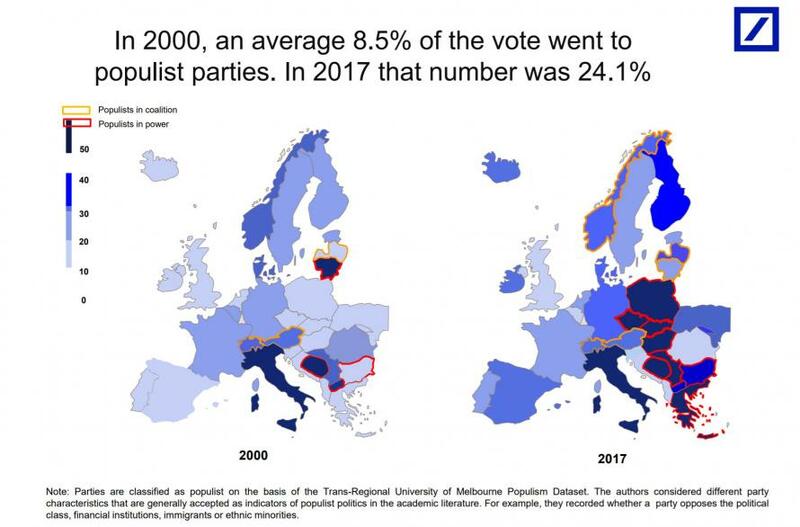 And so one more pillar of Europe's populist establishment becomes a casualty to the continent's growing populist wave. 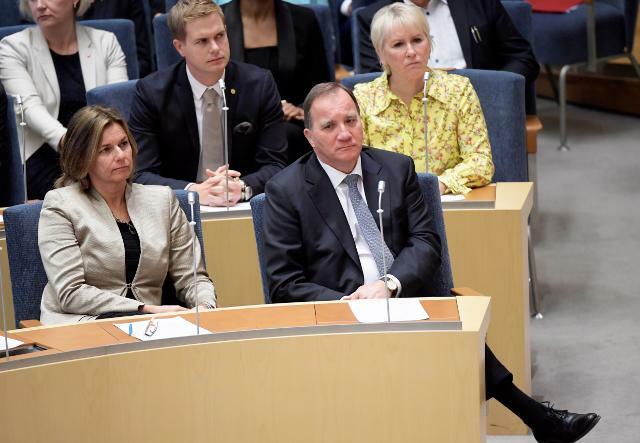 A total of 204 of Sweden's 349 members of parliament voted "no" to Löfven as prime minister on Tuesday morning. No one abstained, 142 voted for Löfven and three MPs were not present in the chamber. The Social Democrats, Greens and Left voted for Löfven, while the Moderates, Centre, Liberals, Christian Democrats and the Sweden Democrats voted against him, according to The Local. Social Democrat leader Stefan Löfven in parliament on Tuesday. The dismissal of Lofven, who earlier refused to step down voluntarily, was anticipated after members of the conservative Alliance announced in advance that they would not support him in Tuesday’s vote. "Today, after the election, we're doing what we promised before the election," the Moderates' Ulf Kristersson, leader of the largest party in the centre-right Alliance opposition, told parliament ahead of the vote. "To the Alliance it is obvious that Sweden needs a new government." Anders Ygeman, the group leader of the Social Democrats in parliament, argued that Sweden's September 9th election gave 143 seats to the four-party Alliance and 144 seats to the centre-left bloc of the Social Democrats, Greens and Left Party. The centre-right however has argued that the Left Party is not formally part of government and should therefore not be counted as part of the centre-left bloc. Political groups on both the left and right achieved the same number of votes in the general election, resulting in neither winning a majority in parliament. The election resulted in major success for the anti-immigration Sweden Democrats, which won 17.6 percent of the votes. However, neither side of the political center agreed to form a coalition with the party. It will now be up to speaker of parliament Andreas Norlén to ask another party leader to try to form a government. Löfven is however set to lead a caretaker government during the weeks or months it is expected to take to find a new head of government. The now former Prime Minister told reporters after the vote that he remained prepared to stay on as prime minister if asked to do so by the speaker, saying he wanted to negotiate across the political divide to seek bi-partisan compromises. "It is my wish to continue serving our country as prime minister. I want to lead a government that enjoys broad support in Sweden's parliament, so that we can leave bloc politics behind and take the country forward," he said. Elections on September 9th left neither of Sweden's main blocs with an absolute majority, with just one seat separating the centre-left (Social Democrats and the Green Party) and the centre-right Alliance (Moderate Party, Centre Party, Christian Democrats, and Liberals). The Sweden Democrats are the third largest group, and some right-wing MPs have suggested cooperation with the far-right party. The Centre Party and Liberals have said they would quit the Alliance if the Moderates and Christian Democrats were to negotiate a deal – for example on immigration – with the far-right in exchange for their support. Another alternative would be for the Alliance to reach a compromise with the Social Democrats on big political issues, such as the autumn budget. The electoral success of the populist Sweden Democrats occurred amid tensions in the country over its immigration policy. The northern European country has long prided itself for its tolerant approach to asylum seekers, perhaps too tolerant: during the 2015 immigration crisis, Sweden took in more people per capita than any other EU member state. Not long after, problems associated with immigrants – including regular torching of cars and other crimes – shifted to the forefront of public debate. This enabled the right-wing party to capitalize on anti-immigration sentiment, ultimately resulting its best-ever result in a general election.